If you are confused by or find it difficult to see where the vital point in a shape is, try to look at the internal space left over after the opponent has reduced the internal space from the outside. 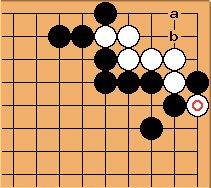 In this case, after Black's reduction (from the outside) and White's answer, the internal eyespace will be the circled points - which is recognisable as the bulky five - and the vital point is the same as for a bulky five. Bill: I think that Andre forgot to add the b to the diagram. I have added a b, based on his comment, but I could be wrong. reduces White's formation to the bulky five and then plays on its key point. Since it threatens to connect, White responds with , threatening , which prevents. 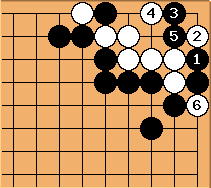 Black may approach from this side and then strike at the vital point with . threatens to live with , which prevents. Then White captures Black's two stones with . But now prevents a second eye, and White dies. After White has eyes at a and , thanks to . xela: Although I think the general principle stated at the top of this page can be useful, I find this particular example confusing. To me, the important feature of the first diagram is the white hane at the top. 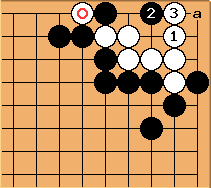 If that stone is removed and there is a hane at the right instead ( in this diagram), then the vital point is at a. What about this as another illustration? If black were to reduce by playing a, then after white b the eyespace is three in a row, so c is the vital point--but black a allows white to live. Black can kill by playing on the vital point immediately. 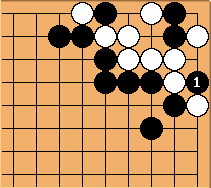 Play on the vital point first: white dies.